One of the best ways to get started with AsciiDoc is to use the Asciidoctor toolchain, and specifically the Gradle integration. Ironically, the documentation on how to do this is not always clear, so this blog is an attempt to make things a bit easier. The above will create a new empty Gradle project. Now, open the build.gradle to add the required configuration for AsciiDoc. 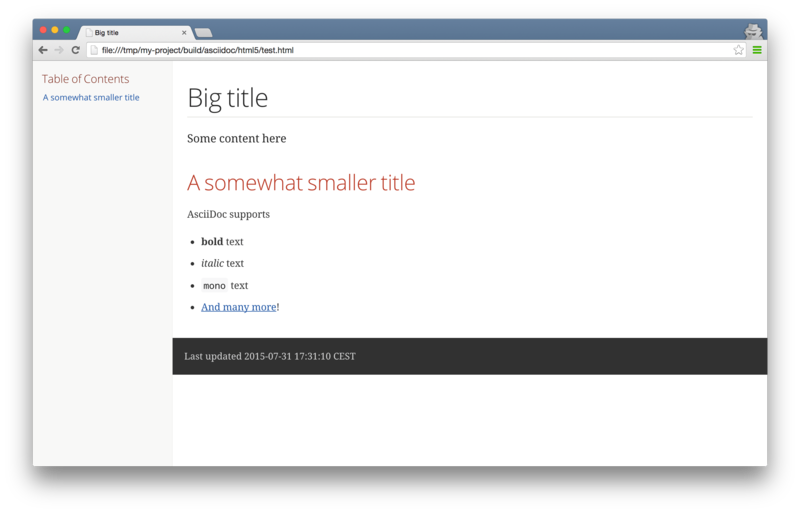 = Big title Some content here == A somewhat smaller title AsciiDoc supports: * *bold* text * _italic_ text * `mono` text * http://asciidoctor.org/docs/asciidoc-syntax-quick-reference/[And many more]! If you now run the AsciiDoc Gradle task, by executing the wrapper script: ./gradlew asciidoc, then a beautiful AsciiDoc HTML file called test.html should end up in build/asciidoc/html5.